It was probably the largest papal Mass in history. On Sunday, an estimated six million Filipinos went to Manila to witness Pope Francis celebrate communion — the crowning event of an astonishing tour. Over four days, the pope condemned corruption, visited a slum and said Mass in a yellow cagoule, lashed by the driving rain. The success of the Philippines “show” tells us two things. First, that outside Western Europe a lot of people still believe in God. In Europe, we tend to regard religion as passe — something they did centuries ago, when unenlightened Europeans took the advice of burning bushes. But beyond the European Union (EU), millions of people stubbornly continue to put their faith in the Almighty. The West may enjoy comparative power and wealth, but its attachment to secular liberalism is a minority opinion. Europe’s loss of faith makes it harder for people to comprehend the wider world and contributes to cultural misunderstanding. Luckily, there is the Roman Catholic Church to act as interpreter. The second thing that the crowds in Manila have shown is that Pope Francis is one of the most important diplomats of his era. He is a bridge between the West and the rest. Of course, that has always been the case. By historical accident, the leadership of Catholicism is located in Rome, but its Christian origins were in the Middle East and many of its early saints and theologians were African. Today, it is a uniquely global Church, with nearly 1.2 billion members. As its official face, the papacy has always enjoyed diplomatic clout. In the early 1800s, the Pope pressured heads of state to suppress the slave trade. In the 1980s, Pope John Paul II united Christians in opposition to Communism. And Benedict XVI made overtures to the Eastern Orthodox — something that his intellectualism and love of liturgy made him especially well-placed to do. The personality of the pontiff helps define his mission. As such, Francis is especially suited to the challenge of reaching out to the developing world. He is the first non-European Pope in nearly 1,300 years, coming from a country — Argentina — whose history touches upon relevant themes of colonialism and struggle for democracy. His emphasis is, sometimes regrettably, not upon liturgical richness but, happily, upon straightforward themes of love and compassion that resonate widely. In the Philippines, former street children asked him why God allowed suffering. When one girl broke down in tears, the Pope told her that crying cleansed the soul and asked why so few other women had been invited to speak. This is a cleric who is prepared to talk frankly and humanely about issues of injustice. His simplicity appeals, too — although it can have a whiff of stage management. Often, the Pope is seen boarding a plane carrying his own bag. Why does he need a bag on a short flight? What’s in it? Paperwork? A toothbrush? One suspects that this is ostentatious modesty. But when talking to the press mid-flight, he displays a rugged kind of faith that, again, citizens of the developing world would appreciate more than “cosmopolitan” Europeans. He decried the killings in Paris, but noted that when people love God like a father, they take a risk when they insult Him. For perhaps the first time, many western liberals were disappointed with Francis — for questioning the wisdom of blasphemy. But those who truly want to understand how Muslims feel about Prophet Mohammad (PBUH) could learn a lot from what he had to say. And those who routinely gripe about the moral conservatism of poorer people should understand that Francis’s blunt traditionalism also goes down well with those struggling to get by. In Philippines, a quarter of the country lives on 60 cents a day and takes spiritual sustenance from a church to which some 80 per cent of them belong. The practical effects of having a pope who can speak to two very different cultures was shown in the rapprochement of Cuba and America. We now know that the Vatican hosted secret talks between officials and that the pontiff wrote to both US President Barack Obama and Cuban President Raul Castro. Obama said that Francis led through “moral example, showing the world as it should be, rather than simply settling for the world as it is”. Which is a very neat summary of Christianity in action — of being the change that one wants to see. So we live in the age of a new super-pope. 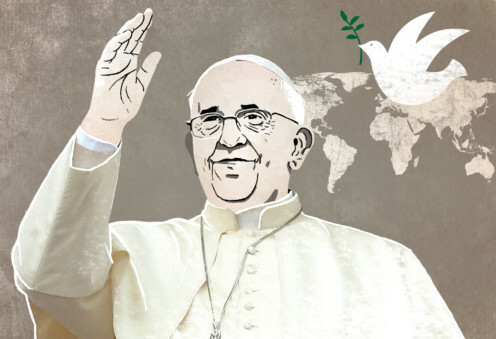 Forbes magazine called Francis the fourth most powerful man in the world; he has been tipped for a Nobel Peace Prize. There are downsides to that, though. Disappointment often trails promise and we must not forget that the Church is bigger than just the pope. Nevertheless, as the West slowly surrenders its claim to leadership over the world, it is fortunate that there is a charismatic transitional figure telling of peace, rather than seeking votes.